Gardeners often feel like the proverbial kid in a candy store when they spy the masses of hydrangea in the garden center each spring and fall. From the candy-colored foil wrapped pots to the large container-grown shrubs, there's a hydrangea for almost any garden. If adding hydrangea to the landscape or garden, choose potted specimens. Avoid the foil-wrapped plants often found in the early springtime in the garden center. While these hydrangea can be planted outside, they tend to be greenhouse raised plants that have not been hardened off to the outdoor climate and conditions. They'll grace your home with charm and blossoms, but may falter once planted outside. For robust, vigorous plants, choose the larger shrubs. Hydrangea macrophylla normalis (Lacecap hydrangea) look similar to the Mophead but have a space in the middle of the flower bundle, giving it a lacey appearance. They're a great choice for gardeners who want a natural, informal look. Hydrangea quercifolia (Oakleaf hydrangea) is native to the United States. As its name suggests, it sports leaves that resemble those of the oak tree. There are single and double blossom white colored varieties. The best feature of the Oakleaf hydrangea is the fall color. Leaves turn crimson, gold, and ochre, adding fall splendor to spring blooms and lush green summer foliage. Hydrangea grow readily in nearly the entire United States. As long as they receive either full sun or full sun to partial shade, plenty of moisture, and rich, loamy soil, they'll happily thrive year after year in the garden.If planting hydrangea in the spring, be sure to wait until after the frost free date for your garden zone. If you plant too early and a cold snap occurs, the leaves may curl up and turn brown or fall off. Don't dig up the plant yet; some hydrangeas will bounce back, but it will take them time to re-grow their leaves. It's best to wait until it's consistently warm, but not too hot. Hydrangea planting begins with proper site selection. 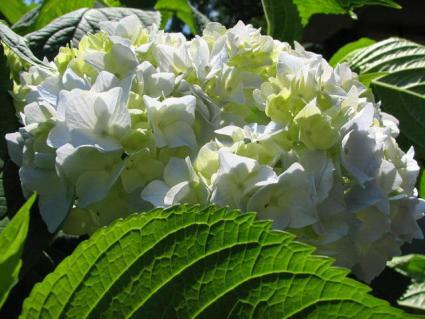 In the northern portion of the United States, gardeners should choose a sunny location for hydrangea planting. Find a site that receives at least six or more hours of direct sunlight every day. In the southern half of the United States where summer temperatures climb over 90 degrees, most hydrangea welcome partial shade, particularly in the hot afternoon. The next step for hydrangea planting is to dig a hole twice as wide and deep as the root ball of the plant. To estimate the size of the hole, start digging, and when you think the hole is big enough, place the entire plant inside its pot into the hole. Once the hole is large enough, add compost to the soil and to the bottom of the hole. Hydrangea need well drained, loamy soil, and compost added to the soil helps by adding nutrients and improving soil texture. Once you've amended the soil, remove the hydrangea from the pot and place it into the hole. Refill the hole with soil and compost. Tamp it down firmly and water well. Be sure to keep hydrangeas moist. Use a rain gauge to monitor natural rainfall and if rainfall is less than an inch per week, provide additional water. With just a little bit of care, your hydrangea planting will thrive an add variety, interest and beauty to the garden for many years to come. Another fun aspect of hydrangea planting is growing your own hydrangeas from cuttings. Hydrangea are easily propagated by cuttings. The best time to make a cutting is in the spring. Using clean, sterilized scissors or pruning shears, cut a section approximately eight inches long from a branch that isn't flowering. Dip the end in rooting hormone powder if you have it, or simply place the end in moist soil in a pot with drainage holes. Place in a bright, sunny and warm windowsill or under plant lights. Keep the soil moist by misting or frequent watering. When new leaves begin to form, the hydrangea has developed roots. If it's warm enough outside you can plant it outside or enjoy it inside for a while longer.